Samsung on Thursday launched world’s first smartphone with quad (four cameras) rear camera setup called the Galaxy A9 (2018). 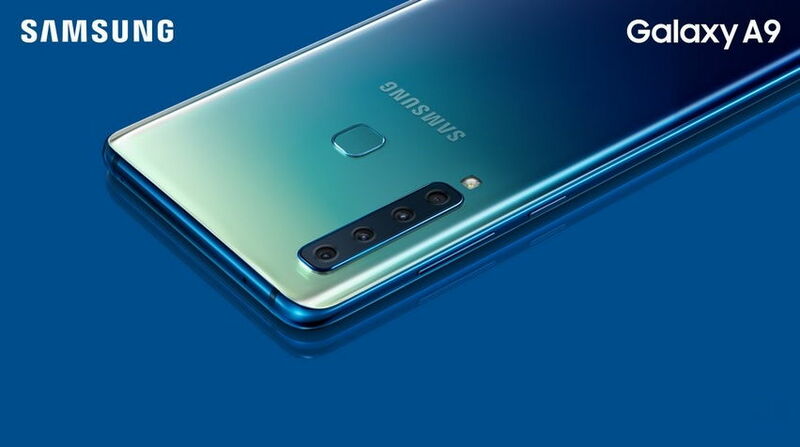 The main key highlight of the Galaxy A9 smartphone is the four vertically staged rear cameras on the back. The Samsung Galaxy 9 is a mid-range smartphone which comes with premium camera features. As I said above, the main key features of the Samsung Galaxy A9 is the four cameras setup, so I will talk about it first. The first camera lens has an 8-megapixel ultra wide sensor with a 120-degree field of view and f/2.4 aperture. The second one is a 10-megapixel telephoto lens with 2x optical zoom, f/2.4 aperture. The third lens has a 24-megapixel sensor with f/1.7 aperture and the last and the fourth sensor is a depth camera with 5-megapixel resolution and f/2.2 aperture. On the front there is an 8-megapixel selfie shooter. Now let’s talk about the hardware specs, the Galaxy A9 sports a 6.28-inch Super AMOLED display with full HD+ resolution and it is powered by a Snapdragon 660 processor coupled with 6GB/8GB of RAM and 128GB internal storage which can be further expanded via micro SD card up to 512GB. The device runs on Android Oreo with Samsung’s own TouchWiz UI on top. The device packs a 3,800mAh battery. The Samsung Galaxy A9 (2018) will be available in select markets starting next month. It will be available in three Caviar Black, Lemonade Blue and Bubblegum Pink color options however, there is no pricing detail as yet.